Our newest Next-Door Neighbor story isn’t about an axe murderer or the pervert next door, but rather a quieter tale of a small childhood trauma many of us can surely relate to. “Indoorsy,” by Shawn Kittelsen and Kat Roberts, recalls Kittelsen’s introverted young nature and his struggles to fit in. “I was an indoorsy eight-year-old,” he explains as the story begins. 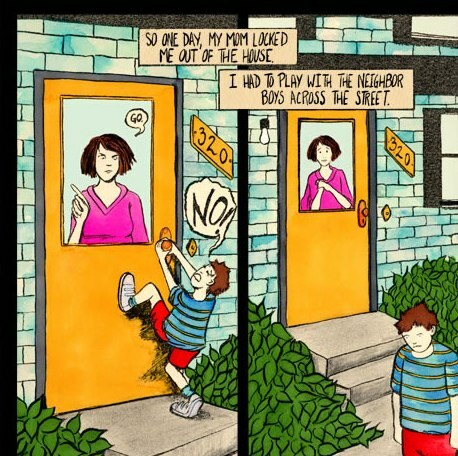 “I wasn’t shy, I just didn’t understand the appeal of tag and wiffleball when I could stay inside reading comics or dancing along to my tape of the “Thriller” video.” Find out about the horror that awaits young Shawn when Mom makes him….go out and play. Want more about the neighbors? Jonathan Ames, Nick Bertozzi, Harvey Pekar, and many other writers and artists tell 20+ true stories about the freaks, geeks, and weirdos from the block in the NDN archives. Great story! I was this type of introvert and watched thriller 100 times. It still fascinates me. Just visit this website homepage http://theyahtzee.com and get your self entertain with some amazing experience and play this most popular Board game free.